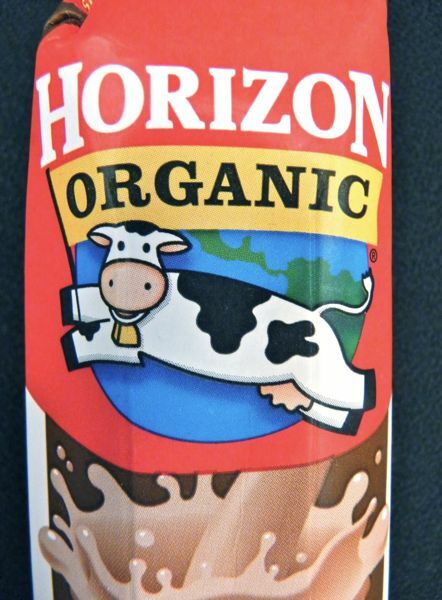 This handy, lunchbox-sized container of organic, chocolate lowfat milk was made with organic cocoa and evaporated cane juice. The tiny carton came with its own tiny, telescoped straw, and was emblazoned with two cartoon mascot versions of black and white Holsteins -- a popular breed of dairy cow. Organic cows, the label explained, "give an average of 5 1/2 gallons of milk per day. That's about 90 glasses of milk!" After a mention of Vitamins A and D, the acronym UHT also appeared on the container -- an ultra-high temperature processing and packaging method that allowed the Horizon milk to be stored unrefrigerated, and extended shelf life to 6-9 months (for an unopened container). I'd prefer as little processing of any food as possible, but UHT is handy if you need to pack some milk in a lunchbox or snack bag for eating on the go. Today was Day #2 of Chocolate Cow Theme Week.